I first knew about Project Pie when we were on the way home to Makati from Kanto Freestyle Breakfast a few months back. We passed by it, and it got me really curious. A new place brimming with people. I really liked the black and white facade too. We already had the DIY burgers courtesy of BRGR Project, and now, DIY pizza? Sounds good to me! 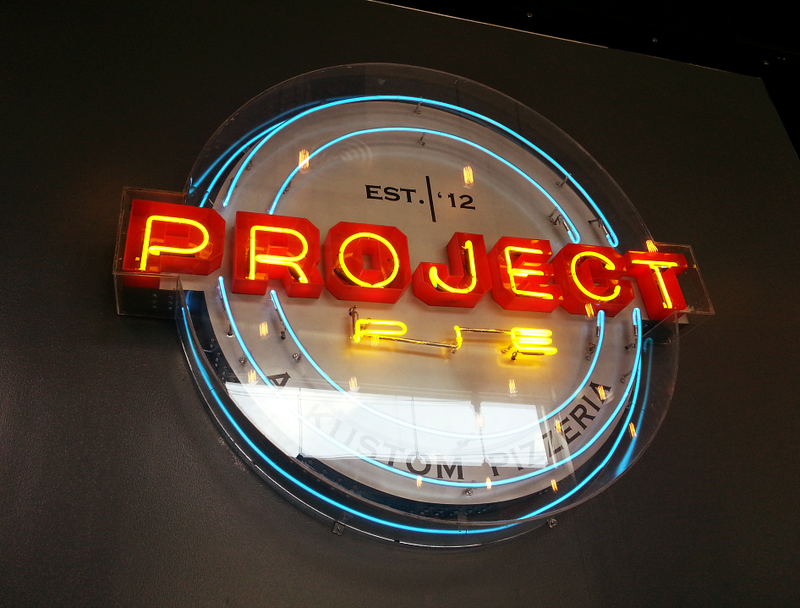 I've never heard of Project Pie prior to that but after a quick Google search, I've read that it originated from San Diego, California, created by James Markham. 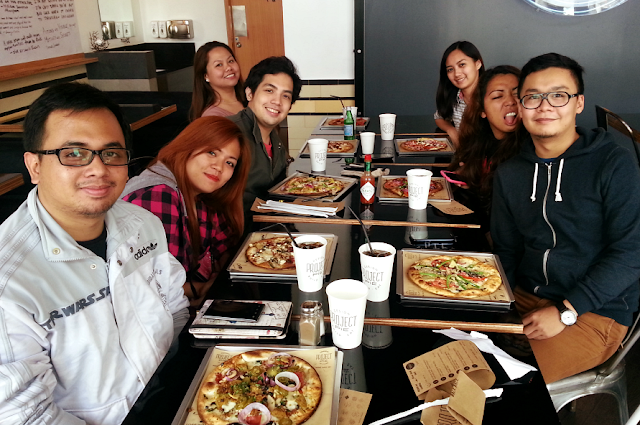 Would you believe this is their first international franchise? Manila ahead of everybody else? Now, that says a lot. One morning after work, a few of my friends and I decided to check this place out. The place was empty when we got there (actually, it was still closed when we arrived haha) so we're able to choose where we want to be seated. I thought the interiors had a very "industrial" feel to it, with all the black and the steel and elbow pipes evident in the place. There's something bare about the place. I really liked the light bulbs! There were scribbles everywhere! On the tables, the counter, the walls and most of the surfaces. 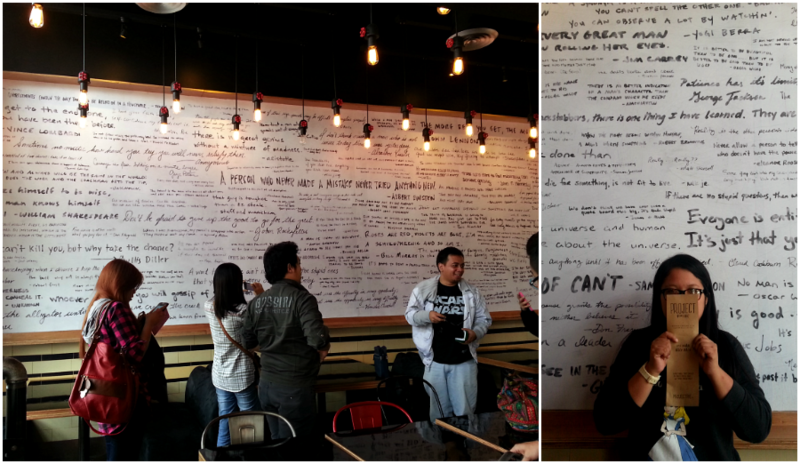 There were also 2 walls filled with famous sayings by famous people on the opposite ends of the place. 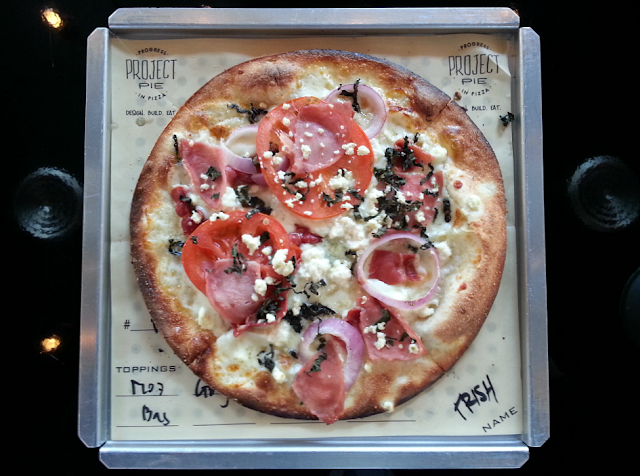 So, how do you make your own artisan pizza? There are 7 custom built pizzas if you're not in the creative mood (Order By Number) or you can use these as a base pizza, and you could add your own twists along the way. Step 1: The dough is pressed using the machine one the left of the photo. I think this ensures the uniform thickness and circumference of all the dough that's going to pass through the brick oven. 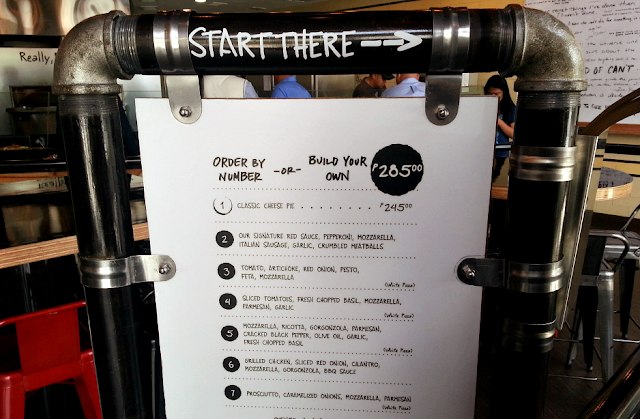 If you're going for a customized pizza, you will then be asked to pick the sauce you want. The choices are white (olive oil) and red. I've read on some blogs about the BBQ sauce but I think we were not offered that one. If you choose Order By Number, just tell them what you prefer and you'd be asked to go straight to the counter. 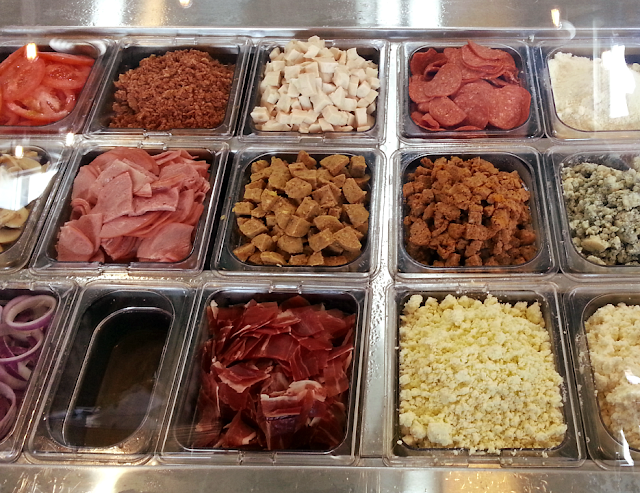 Step 2: Pick your cheese! 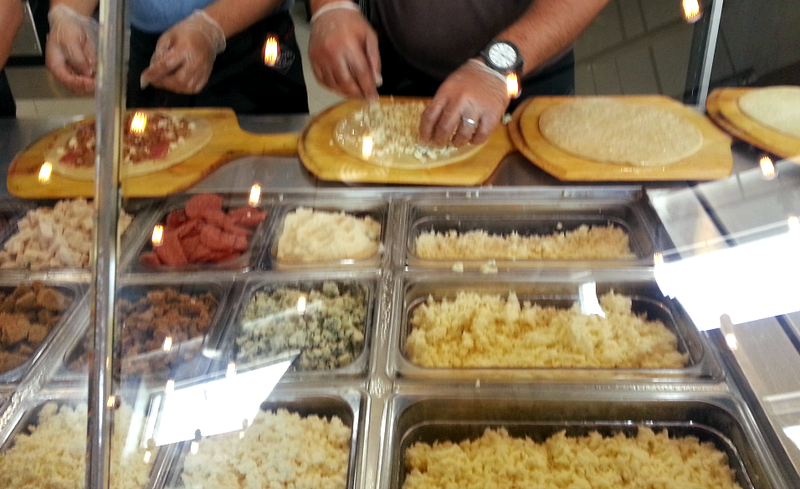 Choices are parmesan, ricotta, gorgonzola, mozzarella and feta. Step 4: Some veggies and a little heat? Veggies/fruits and spices available are: mushrooms, caramelized onions, tomatoes, pesto, black olives, garlic, artichokes, chopped basil, rosemary, red onions, pineapple, dried cranberries and dried walnuts. Step 5: You'll be asked for your name then you'll be given a piece of paper to hand to the cashier so you could pay. You'll also be asked for your choice of drink. There's sparkling water, beer, wine or soda (Coca-Cola products). Then just wait for your name to be called! 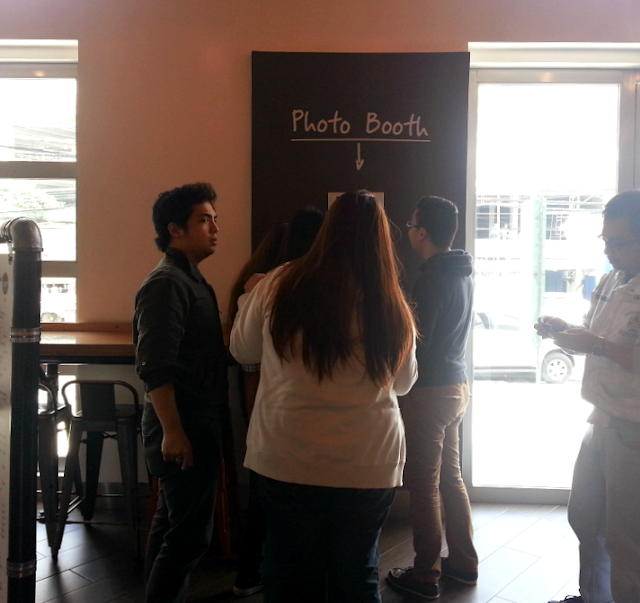 There's also a photo booth that you and your friends can enjoy while waiting. My DIY pizza! This is white pizza that had gorgonzola and mozzarella cheese, Canadian bacon, prosciutto, tomatoes, red onions and basil. I think I unconsciously made a Margherita pizza. Hehe. I wish I went crazy with the toppings! It was just okay. I thought that the toppings were concentrated on the center, leaving quite a gap from the ends of the crust. This is not a thick crust pizza so the ends of the pizza were too dry and tough after baking. I'll try their custom flavors next time so I could tweak it according to my taste. 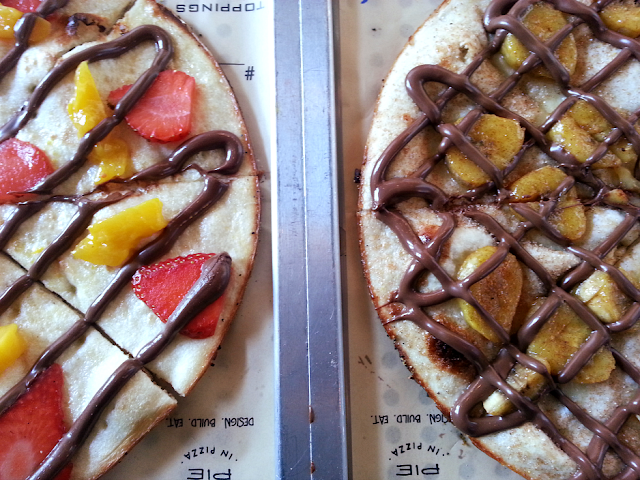 For dessert, we ordered a Strawberry Mango Nutella pizza and Banana Nutella pizza. Almost all of us preferred the Banana Nutella because it was sooo good unlike the Strawberry Mango Nutella that tasted so dry and flat. The little pieces of strawberries and mangoes where scattered on the crust, and that's all there is to it. On the other hand, I think the banana slices of the Banana Nutella pizza made the crust more chewy that's one the crust ended up not to tough. The Nutella drizzled on top was more generous too. Gooey hazelnut goodness! 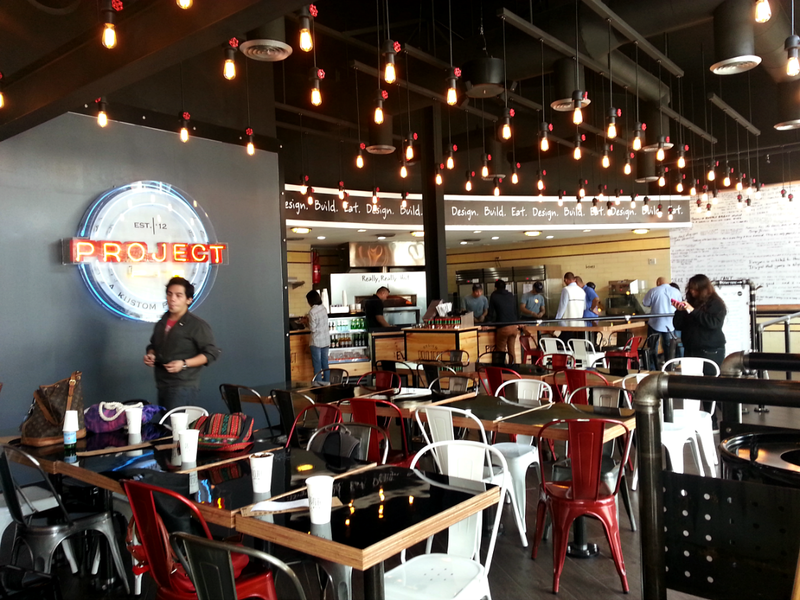 It was certainly great that the Prietos brought an innovative pizza chain to our shores. Your imagination is the limit! I think it's best to have an idea of what you want to do when you come to Project Pie, you really don't want to hold up the line. Everything besides the Classic Cheese Pie cost PhP 285 so don't be afraid to unleash your creativity. The staff were really friendly and accommodating to each query that we made. Kudos to that. Not itching to come back but definitely will try again sometime soon! PS. I read there's really long lines during peak hours and on weekends. We went there on a weekday morning so we didn't have any trouble waiting that long.